The new mobile year has just started, but it already brought in a lot of changes and transformations that will impact the market soon. At the end of the third quarter of 2018, we saw 2 million apps in the App Store and 2.1 million apps on Android. This year, these numbers have the possibility to triple. IAB has said, that two-thirds of the overall digital ad spend accounted for the mobile ecosystem in 2018. The programmatic revenues obtained from mobile and in-app advertising have also increased and reached 43% of US display revenues. Another megatrend that is coming our way is wireless 5G, which is 20 times faster than current 4G standard. The speed is supposed to be the main catalyst change, since all apps along with content, will be loaded much faster. This means, advertisers and app marketers will have many more possibilities to enhance in-app experience and present their offers to users. There have been big shifts in mobile technologies at the beginning of 2019. 5G, undoubtedly, was the most important of them. With 5G mobile internet speed will be sufficient for downloading entire movies in seconds. This will also bring in new quality changes to video game experience and online shopping. This technology is not only about making smartphones faster. It will affect the speed of many other device types, including industrial robots, surveillance cameras, drones, and cars that exchange traffic data. Faster networks will encourage the use of AI and other advanced technologies. When it comes to VR applications, usually they require bulky headsets that connect to nearby personal computers. 5G promises to streamline connection between computers which will improve the navigation and facilitate the development of better VR glasses. When this moment comes, advertising will go to the streets. Thus, for instance, directing their cameras on the football game, the users will see the video and player statistics combined with branding content on their VR and AR devices. So far, 5G networks represent competitive advantages for such countries like China and the US. However, by 2025, 15% of worldwide networks in Japan, the European Union and South Korea, will operate on 5G, according to Mobile World Congress experts. Application revenues from the introduction of AI and MA are continually growing and will exceed $100 million by 2025. According to Gartner’s research, 200 of the largest companies in the world are actively implementing and relying on machine learning data and AI in daily operations. Machine learning can be beneficial across various business verticals, such as logistics, IT, and retail – mediums where large unstructured data arrays can cause a problem. The development of applications based on AI helps to decrease the workload of support teams. Such chatbots like Watson Assistant, Ada, Bold360 or Rulai are already smart enough to respond, like humans, and answer complex customer queries. Artificial intelligence can be used to interpret users’ behavior and provide them with more personalized advertising recommendations identical to programmatic advertising. Machine learning is a technology which automates the tasks related to users data in order to eliminate the human factor and analyze large arrays of media-trading information in real-time. Classic placements on websites adapted for mobile. Placements in mobile applications, which quickly grows in popularity, due to the fact, it supports efficient interactive formats like Playable, Rewarded and Reveal. Apart from it, the information about the app is more diverse than technical details about the website. Also, such an ecosystem is perfect for serving interactive ad formats which bring in the highest ROI, along with video completion rates and engagement. The header-bidding solution, which for a long time, was only available for desktop is now adapted for mobiles. The developers implement it on the server side or integrate the SDK with a wrapper inside the application. Afterward, the bid requests from advertisers are obtained simultaneously. This removes bidding priority limitation of ‘waterfall’ and raises the competition and inventory value as a result. This is only a beginning of the opportunities in mobile programmatic. Smartphones provide more accurate user geolocation data in real-time that helps brands to target their customers when they’re near their stores or regularly visit certain venues. This kind of targeting gave birth to a new type of mobile advertising called geo-fencing. Typically, apps found on Google Play or in the App Store, many users regard as licensed and safe. However, upon their launch phases, more than half of all mobile applications fail to pass necessary security tests. The most common mobile security vulnerabilities are weak server-side controls and weaknesses in protocols and hardware. That’s why today, developers are advised to screen their apps in ZAP, Micro Focus, and Kiuwan before downloading to the store. The unpleasant consequence of smart mobile monetization is also smart fraud. Everything can be faked: impressions, clicks, installations, even actions in the application – sessions, registrations, and purchases. The share of detected fraudulent traffic on CPI-model has reached 40%. 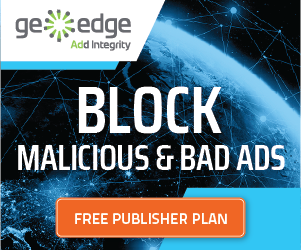 If you buy traffic through mobile exchanges or CPI advertising agencies, learn how to recognize and block fraud by using anti-fraud filters, tracking behavioral abnormalities, and by creating blacklists of apps or suspicious websites. In May 2017, IAB Tech Lab released a new tool to combat illegal inventory trading – ads.txt. It contains the name of the partner and publisher’s account identifier. By now, Ads.txt technology has been implemented by half of U.S publishers from the Alexa Top 10k list. Last year, IAB took another step towards fighting against ad fraud by launching ads.cert specification. It signs every detail of inventory, confirming that it came from a trusted publisher. This way, ads.txt, and ads.cert go hand-in-hand combating ad fraud from different angles. While ads.txt is responsible for the prevention of illegitimate inventory arbitrage and domain spoofing, Ads.cert validates the bid-request information presenting all inventory-related information to advertisers. In 2019, mobile applications will become even more personalized and user-centric. Machine learning, artificial intelligence, 5G, and IAB certifications are the primary drives that propel the mobile landscape towards new qualitative changes. Along with technological improvements, we will see the rise of mobile programmatic advertising and the introduction of new interactive ad formats that help brands attract users more effectively. The trends are constantly changing, especially when it comes to mobile marketing. Updating and modernizing your mobile strategy in accordance with trends may be a good practice if you plan to stay ahead of the competition.